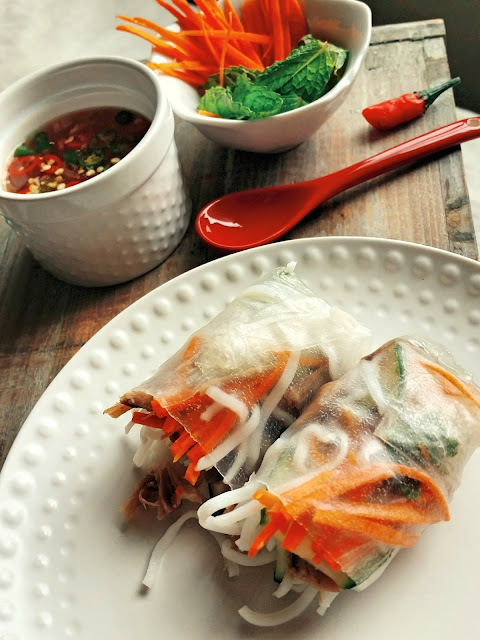 Spring rolls are deliciously versatile. I've made them with lamb, teres major, shrimp, ahi tuna, flat iron, and many other proteins. 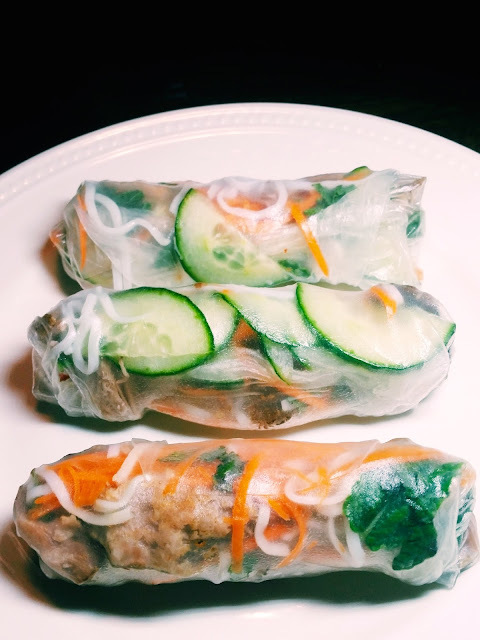 Just type in spring rolls in the search bar on the right side of my site, and you'll see! 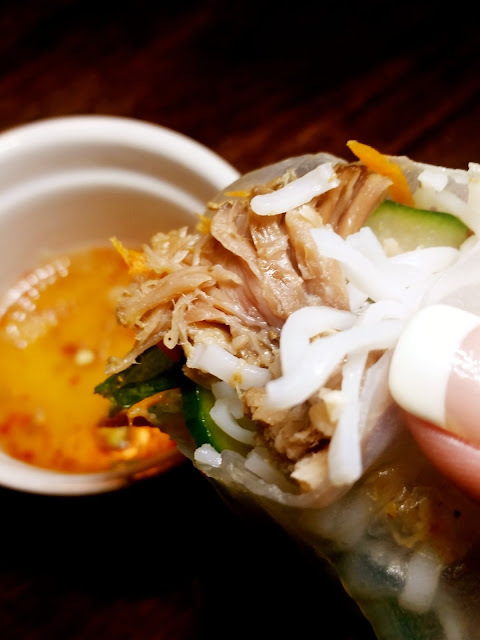 Slow cooked, succulent country style ribs meld perfectly well with the crisp cucumber slices and julienned carrots inside the soft rice paper wrapper. 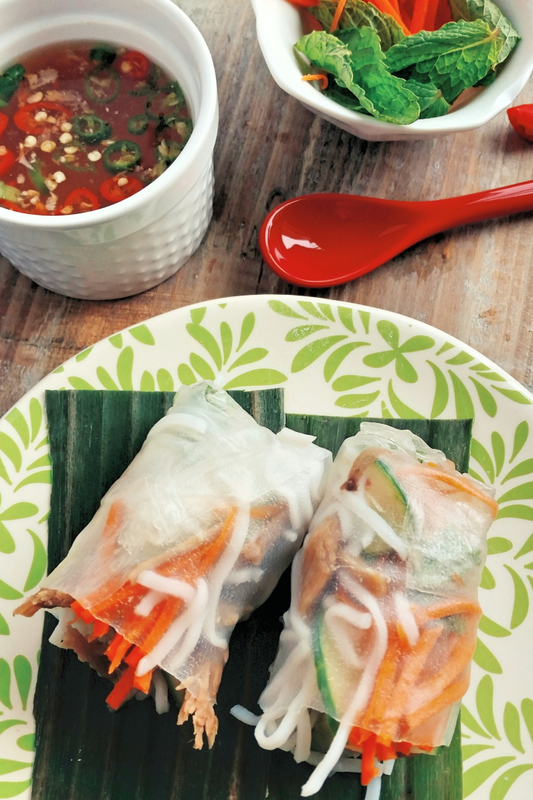 Fresh herbs always make spring rolls even better! It's really easy....3 pounds of country style ribs, in this case, these 4 shown above, in the oven at 300 degrees for 2 hours. Or you can go heavy on the peppers! 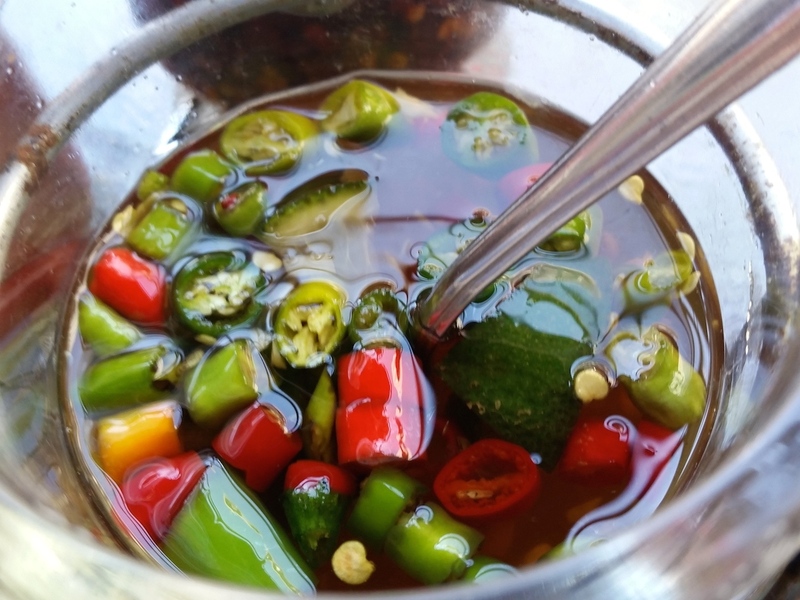 What is your favorite fish sauce, by the way? 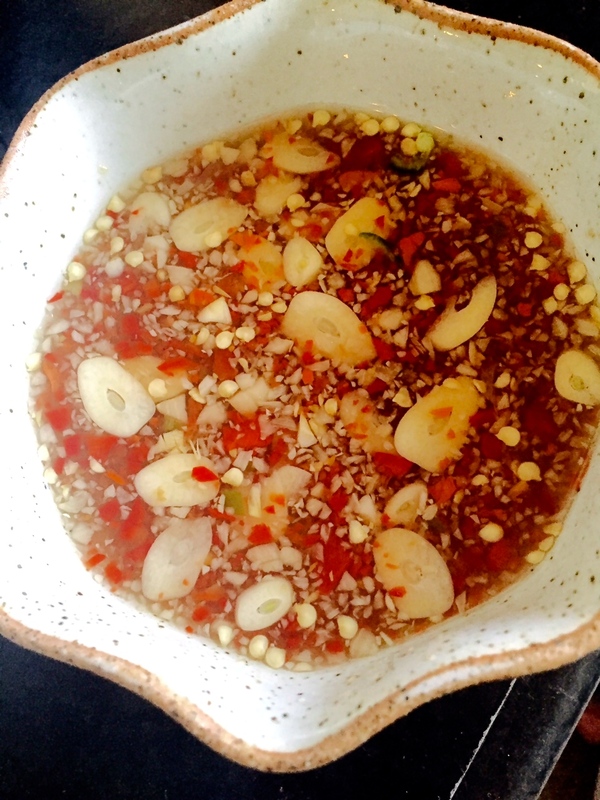 Lately Red Boat Fish Sauce is everyone's favorite, out of Viet Nam, in Phu Quoc, first press, extra virgin. No added preservatives or MSG!! Very Portland, Oregon, I'd say! I feel like no 2 spring rolls are created the same: take these for example! 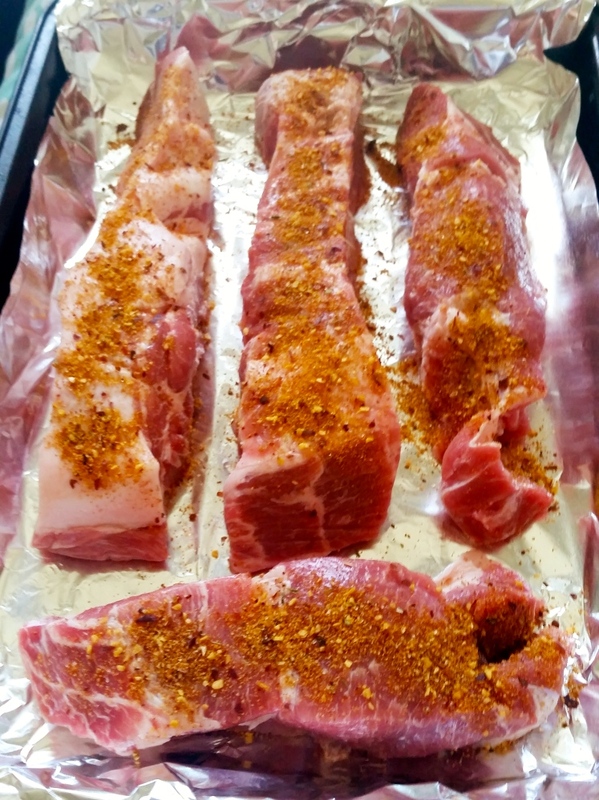 Season the ribs with your choice of spice rub, such as Asian or five-spice powder with turbinado sugar. Line a 9 x 12 pan with aluminum foil. Place the ribs on top, then cover with more foil. Shred the meat with 2 forks. Make the spring rolls by wetting the rice paper under warm water. Lay on a plate to soften. Place filling ingredients on top: rib meat, herbs, carrots, vermicelli. Fold in both sides, then roll up to make a roll. Mash the chilies and garlic together, or chop in a mini chopper. Add the fish sauce. Top with sugar. Add the warm water, then stir till the sugar dissolves. Add the lime juice and stir, continuing to flavor if needed.